Denton is located in Denton County in Texas. The city was formed in 1846 after a Texas land grant was issued. The city was actually incorporated in 1866. The town and count was named after a Texas militia captain named John B. Denton. When the railroad came through in 1881, the town began to flourish. Denton is located at the north end of the Dallas/Ft. Worth area and is very convenient to Interstate 35. The summers in this area are relatively hot and humid. 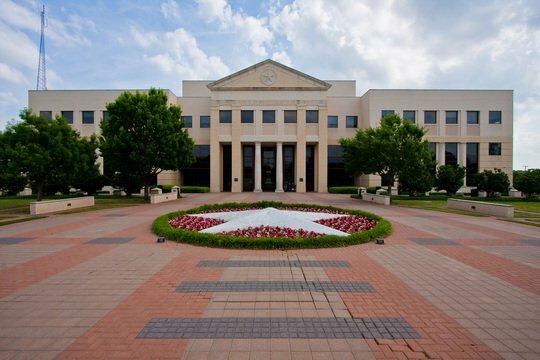 It is the home to one of the campuses of the University of North Texas. With mild seasons you can basically look for an apartment at almost any time of the year. Naturally you will want to adhere to the college schedule when looking. Most students will be looking for apartments right before each semester so applying early is probably your best bet. The earlier you apply the better your chances are of getting into the complex that you want. Landlords in the Denton area can be a picky as they want when it comes to tenant selection. With being close to a major city, Denton landlords are very selective. They are looking for tenants who are responsible and reliable. They are not looking for the rowdy, party crowd but for someone who will take care of their unit and pay their rent on time. Denton has a public transportation system. The Denton County Transportation Authority provides services to county residents. You can check their website at https://www.dcta.net/ for fee, route and schedule information. Naturally there are local taxi's available as well. However it is highly advised that residents have their own transportation. While you can walk to some areas, being outside a major city means you need a vehicle to get around. Denton has plenty to see and do. You can take a tour of the Courthouse Museum. It's a great history of the towns courthouse which was built in 1896. There is also the Bayless-Selby House Museum, the Center fro Visual Arts, the Lone Star Indoor Sports Center and more. Denton is a smaller town, so some of it's attractions are quirky and small, rather than the epic landmarks that mark some of the nation’s bigger cities. A perfect example is the Little Chapel in the Woods. This small chapel is a historic building located on the University Campus, and is considered one of the most beautiful historic buildings in the Denton area. The Courthouse on the Square Museum is another worthwhile day-trip. It is also perhaps the best place to become acquainted with the history of the small city. For an authentic Texas dining experience, you can't beat Rooster’s Roadhouse. Pit barbecue fare and an authentic Texan atmosphere make this place a must-visit during your time in Denton. Bet the House BBQ is another good option if you're a barbecue fanatic. One of the consistently best reviewed breakfast restaurants in town is the Old West Café, which is also popular for managing to keep their prices low for their customers. Denton has also caught on to the artisan burger movement that seems to be sweeping the country. The LSA Burger Co makes fantastic burgers, and has a rooftop bar for enjoying summer nights. For a change of pace from the Texan influence that is so strong throughout the city, visit the Abbey Inn Restaurant & Pub. This traditional British pub features enough American food so that you know you're still at home, but enough British character to make it a nice change of pace from the local norm. For a laid back night out with simple pub food and affordable beer, Two Charlie’s is the place to go. Sports fans that just want to watch the game should head to The Labb. The Greenhouse is a jazz club that has high-quality food and some fancy cocktails that you won't find anywhere else in the city. Denton is home to several fascinating museums. The Bayless-Selby House Museum is a great insight into life during the Victorian era in Texas. The Denton County Courthouse on the Square Museum is a converted Courthouse that now teaches visitors about the history of Denton County. Denton is also home to some live theatre. The Campus Theatre used to be a cinema but now operates as a performing arts venue. Opera, theatre and live music all appear in the venue at various times throughout the year. Live music is also alive and well in the city. The city operates a Thursday night concert series outside the Courthouse on the Square throughout the summer months. The Denton Arts and Jazz Festival has a history stretching back more than 20 years. At the end of April each year, more than 200,000 people will pass through the festival as they listen, eat, watch and buy the very best that Denton has to offer. The Arts, Antiques & Autos Extravaganza is a great way for people with a variety of interests to come together and celebrate under the umbrella of a single festival. There is a significant air show in June, and August brings about the North Texas State Fair, which draws attendees from throughout the region. The Golden Triangle Mall is a great place to go if you just want a straightforward mall shopping experience. Anchor tenants like Macy’s and Sears ensure you can find everything you need in a single trip. If you're more interested in hunting small shops for obscure and one of a kind items, then the town square is where you want to go. Housed in historic buildings, shops and stores of all types fill this area. There are a lot of great antique dealers in the area, so anyone with an interest in these kinds of items should be very pleased by what they find in Denton. Like almost everywhere in Texas, the residents of Denton take their sports seriously. The University of North Texas is definitely the dominant athletics organization in the area, and the North Texas Mean Green games are always attended by thousands of Denton locals. People who are new to town often report that the best way to get to know some of their neighbours is by attending a Mean Green game. The Division I athletics program now competes in Conference USA. The football team has been dominant for years, and at one point won four Sun Belt Conference championships in a row. Although the school has produced plenty of famous athletic alumni, perhaps none are as well known as Mean Joe Greene. There are a number of lakes in the surrounding area right around Denton. Getting out on a charter tour is a great way to get familiar with the country if you're new to town. There are also three excellent golf courses in the immediate area. If you'd like to get out to the city and relax at the lake, you should head to Lake Ray Roberts. The lake is a twenty-minute leisurely drive north of town, and is one of the most popular weekend destinations with Denton residents. The area around Denton is also known as horse country, and a great way to see the countryside is to get out on horseback and explore.